THE slow-moving disaster at the Fukushima nuclear plant in Japan that is spreading a cloud of anxiety across the world has forced most nations to either suspend or review their nuclear power programmes—but not India. In the aftermath of the earthquake and tsunami that struck the huge Daiichi power complex of the Tokyo Electric Power Company, two things have happened: a series of disclosures that have exposed more of the nuclear industry’s dark secrets, not least in Japan, and a rethink by several countries and utilities that had planned new projects. Switzerland has suspended plans to build and replace plants. Germany, which had approved delaying decommissioning of its 17 plants, has put that on hold, and China has suspended approval for all new nuclear power plants. Its initial response to the earth-tsunami catastrophe in Japan had been a firm “no rethink”. Analysts think the turnabout signals a move to tighten safety and risk-assessment norms for new projects. The most dramatic impact has been in the US, with NRG Energy saying its plans to build two big reactors at its Texas plant could be delayed, or cancelled. India, on the other hand, appears cocky. Officials say the country will push ahead with its ambitious expansion agenda, including the much-opposed Jaitapur and Mithi Virdi nuclear power complexes in Maharashtra and Gujarat, respectively. The Atomic Energy Commission (AEC) Chairman Sri Kumar Banerjee is categorical that there will be no pullback from the proposed projects since none of these, he says, are in danger from either earthquakes or tsunamis. As for technology worries, there would be a “review” of the French company Areva’s controversial EPR reactor, six of which are planned in Jaitapur. This would make for the world’s largest nuclear energy complex with 10,000 MWe generation capacity. To give a comparison, the Fukushima Daiichi plant’s six reactors have a total capacity of 4,696 MWe, and at the time of the calamity only three were operational. Currently, work is under way on six projects in India: two Russian-built light water VVER reactors at Kudankulam (1,000 MWe each), and two pairs of indigenously developed pressurised heavy water reactors (PHWR) of 700 Mwe each in Rawatbhata, Rajasthan, and Kakrapar in Gujarat. But more bold, and marking a sharp turn in the country’s nuclear programme, are the big nuclear power-generating parks in five locations, all coming up with foreign technology. AEC says there will be no change in the planned structure of these new parks. Instead, there is to be a safety audit of the 19 projects India’s sole nuclear generator, the Nuclear Power Corporation of India (NPCIL), operates. So far, no clear answers are forthcoming on what this entails. Sudhinder Thakur, distinguished scientist and fellow at NPCIL, told Down To Earth that “NPCIL engineers have commenced work on ‘scenario building’ exercises for each of the different technologies we have for our reactors.” Two of these reactors, Tarapur I and 2, are the same GE boiling water reactors as at Daiichi but of older vintage; the rest are PHWRs that use natural uranium. According to Banerjee, however, the safety audit would consist of subjecting the current facilities to different levels of seismic loading. Although each plant has been designed on the basis of the fault lines of the site, “we need to know how it functions in an off-normal situation,” he said in a TV interview, adding, “not that this hasn’t been done before”. March 1993: Fire in Narora Atomic Power Station brought reactor core very close to partial fuel meltdown. Inclusion of a fourth level of safety protection saved the day. Similar fires had occurred in Ra watbhata and Kakrapar plants. The 1993 fire occurred when two steam turbine blades broke. The blade fault had been detected by turbine designer GEC of the UK which had given revised blade design to the Indian manufacturer who, in turn, prepared drawings for new blades. DAE did nothing. May 1994: The Kaiga project was delayed because the containment dome collapsed during construction owing to design deficiencies and lack of quality control. AERB had ordered stress tests in each reactor before start-up and complete simulator installation for operator training. The conditions were not met. June 1994: Flood water entered the condenser pit and the turbine building basements in the Kakrapar reactor in absence of sealing arrangements. Similar floo ding had occurred twice at other stations. What AEC, the umbrella organisation for all things nuclear, and its constituent organisations do, however, remains shrouded in secrecy. The Atomic Energy Regulatory Board (AERB), tasked with ensuring the safe operation of nuclear installations, is notoriously secretive?, although one of its primary functions is to “take such steps as are necessary to keep the public informed on major issues of radiological safety significance”. Instead, it has invoked the draconian Official Secrets Act (OSA) and national security concerns at all times to avoid providing information on accidents—or even on disaster management plans. The disaster management plan for the Kakrapar plant, which was revealed accidentally, showed only chaos would ensue because the strategy was to drive evacuees from villages and towns further away to come to the plant first and then cross the single bridge near the reactors to move away. The only glimmer of hope for a more rational approach has come from A Gopalakrishnan, former AERB chairperson (1993-96) who has battled the establishment to make the regulator independent and more transparent. The problem is AERB is a subordinate organisation of the Department of Atomic Energy (DAE) which makes it answerable to AEC whose chairperson is also DAE secretary. That’s why very few of the “incidents” and accidents (see ‘Close calls’) that have occurred in NPCIL plants are known to the public. In 1995, AERB did a safety audit and identified 134 problems, of which 95 were listed as top priority. These problems had been identified by DAE much earlier (in 1979 and 1987) as issues calling for urgent action. Attempts by civil society organisations to make the report public as a people’s right to know, were squelched by then DAE secretary R Chidambaram who cited national security for keeping it classified. He also invoked the OSA. The public interest litigation was finally thrown out by the Supreme Court, which accepted the DAE’s stance that the AERB report would reveal sensitive data to the “enemy”. Although AERB said subsequently that 119 of the 134 safety issues had been resolved, there is no knowing if all the high priority issues had been tackled. Significantly, the Gopalakrishnan report had noted serious deficiencies in the core cooling systems, the same problem that has made Fukushima a nightmare for the Japanese—and the world. But Thakur maintains there should be no worries on this score. Important modifications have been made to install passive heat exchanges systems that are not dependent on a power source or instrumentation systems to cool the reactors. In other words, unlike Daiichi where all three stages of the cooling system failed, NPCIL’s plants will get a grace period. “Safety is accorded highest priority. Tarapur 2 completed 590 days of continuous operation when it was shut down for refuelling on March 4, 2011. Such a performance is possible only with very high levels of safety,” he declares. It is likely that NPCIL has learned some lessons from its past slip-ups, the most serious of which was the 1993 fire in Narora Unit-1 which brought the reactor core very close to a partial meltdown. But what India is not geared for is the kind of seamless operation to protect citizens that was evident in Fukushima. Not only did the authorities evacuate 200,000 people in a 20 km radius of the stricken reactors, they also had them tested for radioactivity and isolated in case of exposure. As our next story shows such an exercise would be a nightmare in India where disaster management is chaotic and half-hearted. As the Kakrapar plan reveals, the ill-conceived measures would only make matters worse. The INES scale it self is tweaked by the author. THIS IS NOT TRANSPARENCY. INES level 3 is "a serious incident" and not "a serious accident" as shown in the article. Serious accident is at level 6. The purpose of spreading misinformation is not clear?. Further, the depiction of NAPS fire INCIDENT at level 4 in the article is incorrect. NAPS incident was at level 3. 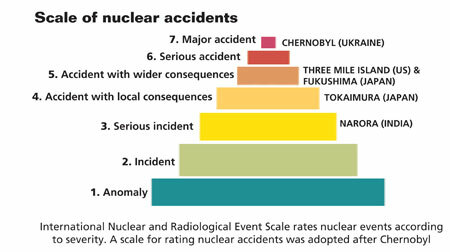 But the Fukushima's accidents should be clearly classified at level 6, three reactors with partial core meltdowns. Plus the fires at some of the spent fuel pools. Counting the 1979 Three Mile Island accident, there have been no less that 5 core meltdowns, one in the USA, one in the former Soviet Union (Chernobyl, 1986), and now three at Fukushima. This represents a probability of one reactor core meltdown every six or eight years, given the existing stock of nuclear reactors producing electricity and unless they start to be decommissioned soon. It was a simple design error and not intended to spread misinformation. that we leave to the nuclear lobby. Thank you for pointing out the error which has been rectified. This is regarding May 1994. This is regarding May 1994. Kaiga units commenced operations in the year 2000. So in 1994 the plant was under construction. This was an industrial accident and there is nothing nuclear about it. To say that "AERB had ordered stress tests in each reactor before start-up and complete simulator installation for operator training. The conditions were not met" is mischievious. There is too much ignorance about nuclear energy. Only truth and facts will help us avoid a Fukushima in India. Thanks to Latha Jishnu for this superb article, for working so hard to inform us, when it is so difficult to get the true facts and figures since the nuclear guys keep their plans secret and work in such an occult manner. Going by Mr Thakur’s reaction to clearly documented facts, it is clear that NPCIL is unwilling to learn from its mistakes. Accusing reporters of malafide intent is the usual refuge of those who do not like the truth to be exposed. 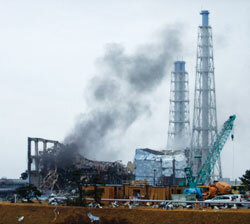 Kaiga incident in 1994 happened six years before the reactors commercial operations began. It is unfair to include in the "close calls". The dome delaminated while the concrete was being poured. After setting in all tests to confirm compliance to specifications were conducted. So no way, dome delamination could have happened. the operations at Kaiga were started only after all approvals of AERB were granted. The suggestion that containment integrity tests were not conducted is not true. There surely are many things right in more than 320 reactor-years of operating experience. It would help if Mr Thakur would spend a few minutes re-reading my response of April 2 before writing rejoinders. Is he saying the AERB report was fabricated or mischievous? I am not the nuclear expert in this instance; it is the AERB. If the suggestion is that the AERB report was wrong in its findings then it calls for another story. As for NPCIL's safety record, I agree that the corporation needs to be congratulated, specially for the awards it has been given by WANO or the World Association of Nuclear Operators which was created post-Chernobyl to maximise safety of plants worldwide. Nuclear safety, however, is a perplexing issue to the lay person. In February 2010, when WANO's governing board met in Delhi and Mr Shreyans Kumar Jain, NPCIL chairman, relinquished the presidency of WANO after more than two years, it was announced that every single nuclear plant in the world had been peer reviewed by WANO. In other words, WANO was telling us that all was well with all the reactors in operation. But after Fukushima, one needs to ask how safe is 'safe'?